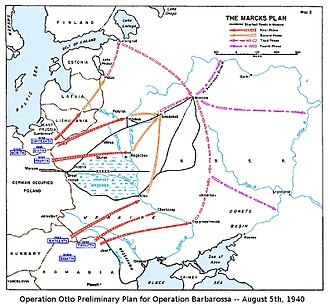 The Vienna Offensive was launched by the Soviet 2nd and 3rd Ukrainian Fronts in order to capture Vienna, Austria, during World War II. The offensive lasted from 2 April to 13 April 1945. The Soviets placed the city under siege, facing only a single Panzer corps. 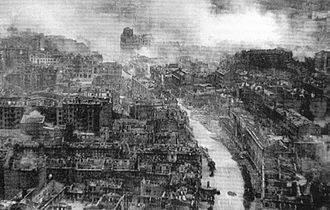 After a few days’ street fighting, the defenders had destroyed all but two of the Danube bridges, and the Panzers escaped encirclement. The incoming Soviets devastated the old city, and there was much brutality against civilians. Stalin approved the restoration of Austria as a sovereign country. 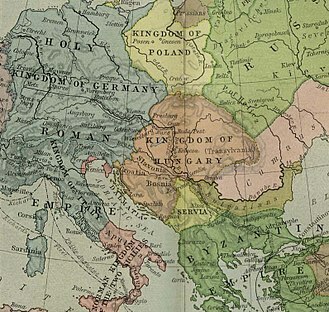 Joseph Stalin reached an agreement with the Western Allies prior to April 1945 concerning the relative postwar political influence of each party in much of Eastern and Central Europe; however, these agreements said virtually nothing about the fate of Austria, then officially considered to be merely the Ostmark area of Greater Germany after the Anschluss. As a result, the victory of a Soviet offensive toward Austria and the liberation by the Red Army of a large part of this country would have been very beneficial for subsequent postwar negotiations with the Western Allies. 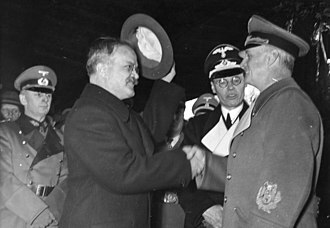 In Spring 1945, the advance of Soviet General Fyodor Tolbukhin's 3rd Ukrainian Front through western Hungary gathered momentum on both sides of the Danube. After they took Sopron and Nagykanizsa, they crossed the border between Hungary and Austria. 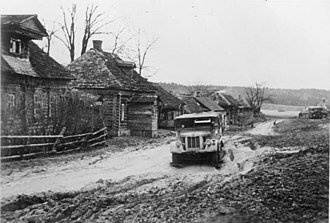 On 25 March, the 2nd Ukrainian Front launched the Bratislava–Brno Offensive by crossing the Hron river. 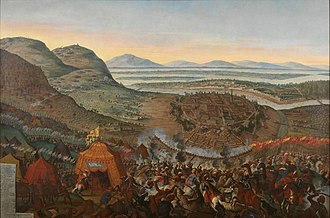 On 30 March the Front crossed also the Nitra River and quickly rushed across the Danubian Lowland towards Bratislava. 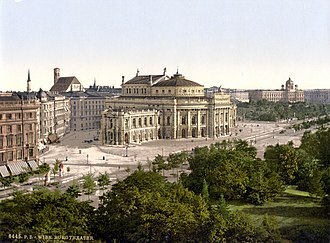 Having secured his right wing by 2nd Ukrainian Front, Tolbukhin was now ready to advance into Austria and take Vienna. After arriving in the Vienna area, the armies of the Soviet 3rd Ukrainian Front surrounded, besieged, and attacked the city. 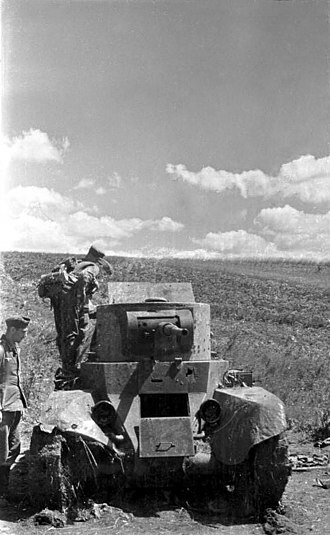 Involved in this action were the Soviet 4th Guards Army, the Soviet 6th Guards Tank Army, the Soviet 9th Guards Army, and the Soviet 46th Army. 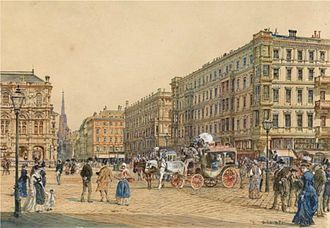 The "O-5 Resistance Group," Austrians led by Carl Szokoll, wanting to spare Vienna destruction, actively attempted to sabotage the German defenses and to aid the entry of the Red Army. 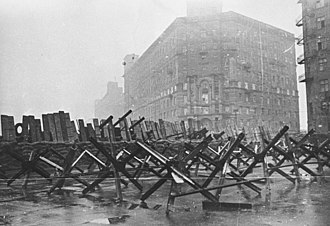 By the 9th of April, the Soviet troops began to infiltrate the center of the city, but the street fighting continued for several more days. On the night of 11 April, the 4th Guards Army stormed the Danube canals, with the 20th Guards Rifle Corps and 1st Mechanized Corps moving on the Reichsbrücke Bridge. In a coup de main on 13 April, the Danube Flotilla landed troops of the 80th Guards Rifle Division and 7th Guards Airborne Division on both sides of the bridge, cutting demolition cables and securing the bridge. [c] However, other important bridges were destroyed. 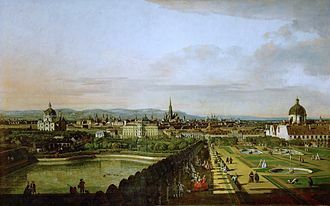 Vienna finally fell when the last defenders in the city surrendered on the same day. [d] Bittrich's II SS Panzer Corps, however, pulled out to the west on the evening of 13 April to avoid encirclement. 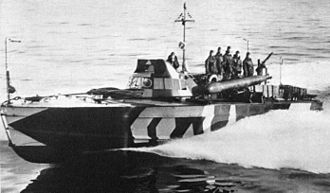 The same day, the 46th Army took Essling and the Danube Flotilla landed naval infantry up the river by Klosterneuburg. On the 10th, all but two of the bridges in the city had been destroyed. The Floridsdorf bridge had been left intact by a Fuehrer Order dictating that the bridge be held at all costs. 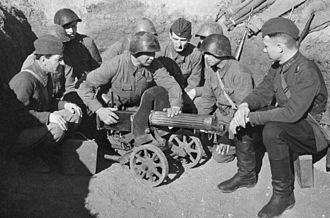 The 2nd SS Panzer, "Das Reich" left a dozen artillery pieces including 37mm anti-aircraft guns to hold off enemy attacks. That night, the "Das Reich", including their last remaining three dozen armored vehicles, pulled out of the city for the last time. Vienna had fallen, and the Germans now moved northwest to hold the next defensive line. By 15 April, armies of the Soviet 3rd Ukrainian Front pushed even further into Austria. The completely exhausted remnants of what had been the 6th SS Panzer Army were forced to flee to the area between Vienna and Linz. Just behind the retreating Germans were elements of the Soviet 9th Guards Army and the Soviet 46th Army. The 26th Army and 27th Armies advanced towards the area north of Graz just behind the retreating 6th Army. The 57th Army and the Bulgarian 1st Army advanced towards the area south of Graz (near Maribor) just behind the retreating 2nd Panzer Army. 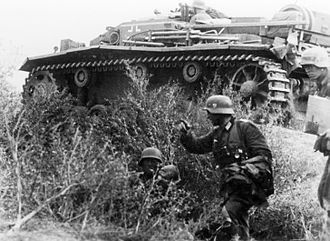 None of these German armies were in any shape to do more than temporarily stall the advancing Soviet forces. Like Bittrich, General von Bünau left Vienna before it fell to avoid capture by the Soviets. From 16 April until the war's end, he led Generalkommando von Bünau, surrendering to the Americans on VE Day. von Bünau was held as a POW until April 1947. Bittrich also surrendered to U.S. forces and was held as a prisoner by the Allies until 1954. Fyodor Tolbukhin went on to command the Soviet Southern Group of Forces and the Transcaucasian Military District until his death in 1949. ^ Nearly all were abandoned due to a lack of fuel. Only a fraction were destroyed in combat. ^ Site soldat.ru lists casualties of 139,815 for the 3rd Ukrainian Front and 9,805 for the 1st Bulgarian Army for the period 16 March to 15 April 1945. ^ Former members of O-5 tell a different story, claiming the bridge guards were actually O-5 members who turned their machine-guns on the Germans when they attempted to destroy the bridge. Toland 1965, p. 354. ^ Descriptions of Soviet actions are from Ustinov 1982, pp. 238–239. ^ a b Frieser et al. 2007, p. 943. ^ Tucker-Jones, Anthony (2016). The Battle for Budapest. ISBN 978-1473877320. ^ a b c d Frieser et al. 2007, p. 953. ^ Frieser et al. 2007, p. 952. ^ Berzhkov 1987, Chapter 5, Section 2. ^ Dollinger & Jacobsen 1968, p. 199. ^ Laffin 1995, p. 449. ^ a b c Dollinger & Jacobsen 1968, p. 182. ^ Gosztony 1978, p. 261. ^ a b c Reynolds, Michael (2009). Sons of the Reich: II SS Panzer Corps. Barnsley: Pen & Sword Military. ISBN 978-184884-000-3. ^ Gosztony 1978, p. 263. ^ Johnson 1989, pp. 135–136. ^ Dollinger & Jacobsen 1968, p. 177. Berzhkov, Velentin Mikhailovic (1987). Страницы дипломатической истории [The History of Diplomacy]. 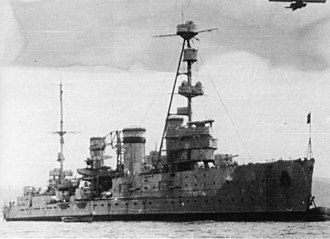 Moskva: Международные отношения. Laffin, John (1995). Brassey's Dictionary of Battles. New York: Barnes and Noble. ISBN 0-7607-0767-7. Dollinger, Hans; Jacobsen, Hans Adolf (1968). The Decline and Fall of Nazi Germany and Imperial Japan. 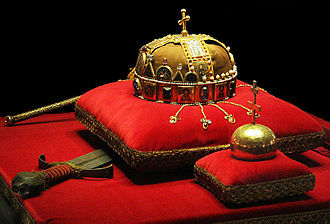 New York: Crown. Gosztony, Peter (1978). Endkampf an der Donau 1944/45 (in German). Wien: Molden Taschenbuch Verlag. ISBN 3-217-05126-2. Johnson, Lonnie (1989). Introducing Austria. Riverside: Ariadne Press. ISBN 978-0-929497-03-7. Jukes, Geoffrey (2002). 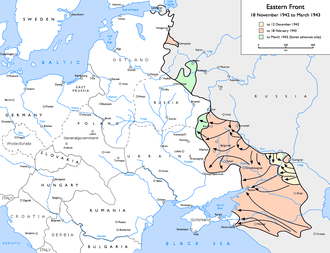 The Second World War (5): The Eastern Front 1941–1945. Osprey Publishing. ISBN 1-84176-391-8. Ustinov, D. F. (1982). 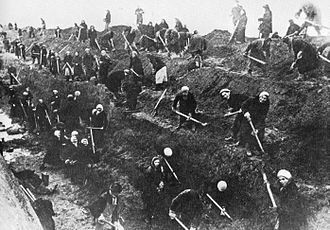 Geschichte des Zweiten Welt Krieges (in German). 10. Berlin: Militärverlag der DDR. Toland, John (1965). The Last 100 Days. New York: Random House. Glantz, David (11 October 2001). "The Soviet‐German War 1941–45: Myths and Realities: A Survey Essay" (PDF). Clemson University. 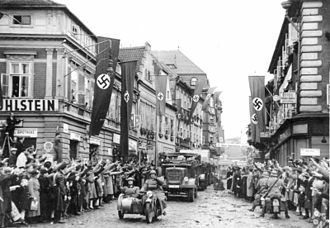 The Austrian Resistance to Nazi rule was launched in response to the Anschluss in 1938. 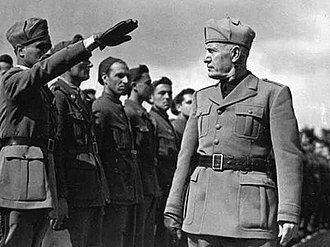 Other strands of Austrian resistance included Catholics and monarchists, however, it is notable that several Austrian nationalists, some of them even with fascist sympathies, opposed to the destruction of the Austrian state. The most prominent unifying symbol was former Crown Prince, Otto von Habsburg, the movement had a prehistory of socialist and communist activism against the era of Austrofascism from 1934. Although the Austrofascist regime was itself intensely hostile to Nazism, especially after the Austrian Nazis failed coup attempt in 1934, the sign of the Austrian resistance was O5, where the 5 stands for E and OE is the abbreviation of Österreich with Ö as OE. This sign may be seen at the Stephansdom in Vienna, the symbol and voice of Austrian resistance was Crown Prince Otto von Habsburg who, had the monarchy been reestablished, would have been Kaiser of Austria. 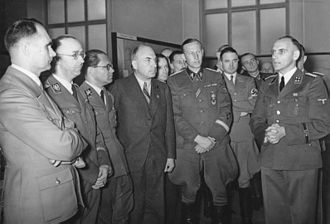 Much as opposing the Nazis was difficult, as maintaining organizational cohesion post the Anschluss constituted an offence, resistance activities were maintained throughout the period. The resistance mainly, issued counter-Nazi political leaflets, collected donations, which were distributed to families of those arrested. Military resistance was limited to occasional sabotage to both key civil and military installations, with most resisting by avoiding postings to the war fronts. Most armed resistance was undertaken in Carinthia, carinthian Slovenes formed a nucleus to the resistance after targeted deportations and forced Germanisation by the Nazi regime in 1942 led to the establishment of forest bands. The Moscow Declarations of 1943 laid a framework for the establishment of a free Austria after the victory over Nazi Germany. 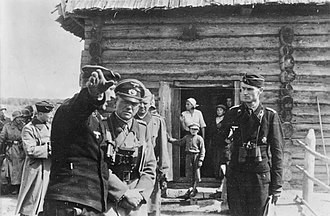 Following the German annexation of Austria, was sentenced to death by the Nazi regime, Rudolf Hess ordered that Otto was to be executed immediately if caught and his personal property and that of the House of Habsburg were confiscated and not given back after the war. The so-called Habsburg Law, which had previously been repealed, was reintroduced by the fiercely republican, the leaders of the Austrian legitimist movement, i. e.
supporters of Otto, were arrested by the Nazis and largely executed. Ottos cousins Max, Duke of Hohenberg, and Prince Ernst of Hohenberg were arrested in Vienna by the Gestapo, Otto was involved in helping around 50,000 Austrians, including tens of thousands of Austrian Jews, flee the country at the beginning of the Second World War. 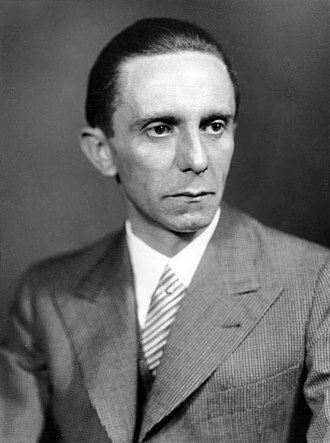 Otto fled to the United States for exile, during his wartime exile in the United States and his younger brothers were in direct contact with President Franklin D. Roosevelt and the federal government. They successfully founded an Austrian Battalion in the United States Army and he obtained the support of Winston Churchill for a conservative Danube Federation, in effect a restoration of Austria-Hungary, but Joseph Stalin put an end to these plans. The organizational cohesion offence was most keenly felt by the Austrian religious community, the Nazis, via both the civil Gestapo and police, and the military Schutzstaffel, implemented both anti-religious and anti-Austrian-patriotic measures.